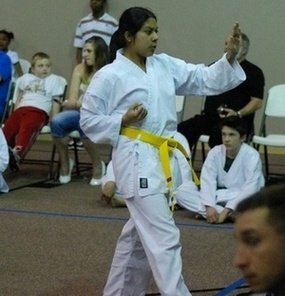 My daughter, Jacquilyn, 15, doing her yellow belt form at a Tulsa, OK open martial arts tournament. She went on to Senior Brown Belt at age 22, before other necessities caused her to step out. She continues to benefit from her martial arts training today. I read far too many articles in hard copy and online that disparage martial arts as being "ineffective on the street". They all go on to say basically the same thing. That you can spend a lifetime learning a martial art, all just to waste your time insofar as it doing you any good in an actual self defense situation, where life and limb is at stake. But let's take another look at martial arts to see just what role it actually plays when someone takes it seriously and achieves the goals that martial arts puts forth. My background is in a Japanese style of karate and Taekwondo. I'm currently, at 53, back in Taekwondo at the Fort Smith Taekwondo Academy after 26 years out of martial arts. So, with the myriad of martial arts styles out there, for the purposes of this article, I'll just stick to what I'm personally familiar with. And this will have little to do with how individual martial arts schools are run or how they train. We will assume that the chief instructor is capable and aware of students individual training levels and needs at those levels. Let's start with a student entering Taekwondo at the full blown couch potato level. Not in good physical condition, somewhat physically awkward, and not particularly assertive. This person, whether child or adult is concerned about their lack of physical ability and generally intimidated by people and situations where an ability to assert themselves is necessary. This concern can be emotional, mental or physical, or all three. This person enters their first class, and as usual, the initial physical activity is awkward and difficult. But with the instructor's encouragement and the camaraderie of other students, the new person feels a sense of immediate accomplishment. The new student presses forward and after a few classes is doing basic kicks, punches and some simple techniques proficiently. And more importantly, confidence is building. This person now walks a little differently, talks a little differently and carries themselves more confidently. And they press on. After a couple of months as a white belt, having achieved accomplishment stripes on their belt, they test for their yellow belt and make it. They advance a belt color. And the sense of accomplishment builds further. The student has become a part of something that is beyond just the punches, kicks and techniques. They have advanced and gained some status for the first time. They are actually now able to help other beginning students. At this point the student may enter a tournament or two. Win or lose, they do it and a new sense of accomplishment is achieved. The student has, over a period of a few months, had something else happen. The endless knuckle push ups, crunches, floor exercises, intense stretching, free sparring, and all the various conditioning exercises take their effect. Their arms are firmer. Their legs will stretch further. Tthey can do things that they never imagined they would be able to do physically. And confidence builds further. As they continue to train and work hard, they advance further in rank and become more proficient and confident in their techniques. They learn to break boards with their hands and feet which teaches them to focus on specific targets. They have now learned to punch, kick, and perform various techniques with power that never existed within them, mentally or physically in the past. By the time the student reaches green belt level, they are proficient and confident in basic sparring techniques and in basic self defense movements. 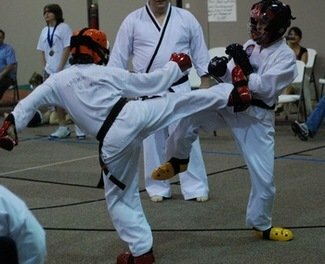 They understand what they can do which is physically stand the rigors of a martial arts class, perform basic movements powerfully, and proficiently free spar with basic and some advanced techniques. As they move forward in rank all of this is enhanced, more power is obtained, more advanced techniques and more proficiency in free sparring. Now it may appear that the path of this person's life is going to continue forever in this article. But actually, this is where I stop for the purposes for which it is written. They become stronger. Their general awareness is heightened. Their reflexes are dramatically improved. Their physical confidence is dramatically improved. They learn to punch and kick with devastating power and focus. They learn what real self defense targets should be. Their mental focus is improved. Now.....exactly how does all that mean nothing when it comes to self defense? Granted, traditional martial arts will not turn the average person into a "street warrior". But the average person doesn't need to be a street warrior. Martial arts will do what it is intended to do. All the factors mentioned in the list above. And all of that will dramatically improve a person's ability to defend themselves, in whatever condition they enter, and whatever "style" of martial art they commit to.